If you plan to do any traveling outside your local city limits, there are several good reasons to purchase a travel guidebook. One is that I have several friends and family members who make their living by writing them. Another good reason is that a little research before you arrive at your destination can help you avoid the ordeal of being part of a tour group. The people who lead those groups know too many facts, and feel compelled to share every last one of them with you. We anchored off Mykonos this morning. Seas were up, so it was a challenge to get into the tender which took us ashore. Sally and I were among the first to get to the island. We determined that we would begin our day here by getting some scenic panoramas from the top of Mykonos. I had seen photos of one of the most picturesque windmills, and had read in the guidebook that its name was Milós Boni. The book also had some directions as to how to reach it, but as we started out, we soon discovered that there were no street signs, in Greek or any other language. There were three windmills spread across the hills above us. I picked out the one I was sure was Milós Boni — it was near the crest of the highest hill. We started a steep ascent up a winding street, which ultimately led us to a very nice windmill, but not the one we were seeking. We walked back down a ways, and tried another route. This also eventually led to a dead end. We retraced our steps and tried a third path. We were much closer this time — but still a hundred yards or so from our desired destination. Sally climbed a low fence and crossed uneven terrain to try to get to it; I reluctantly followed. As she stood on a point with a spectacular view of the town below us, I noticed that we were trespassing in a cow pasture, and that the cows were coming to check us out. We got out of there and went back down the hill, all the way into town. This entry was posted in Travel and tagged Mykonos. Bookmark the permalink. Thanks for your support of the guidebook industry! I can assure you that we were careful to let people know where toilets were in Adventure Guide: Hawaii the Big Island. And we only included accessible golf courses in The Golf Fanatic’s Guide to Hawaii – no pointless cab rides for you! Having liberally sampled the attractions and necessities in both of the books you mentioned, I can unequivocally state that they are well worth the price. The amount of research that you and Bryan Fryklund put into both books is mind-boggling, and I’m grateful that you present all those facts in a way that ISN’T mind-boggling! While I’m at it, I should give an appreciative nod to Storybook Travels by Colleen Dunn Bates & Susan LaTempa. It’s an imaginative approach to traveling with children that was published too late for my kids to benefit, but a “must” for the current generation. 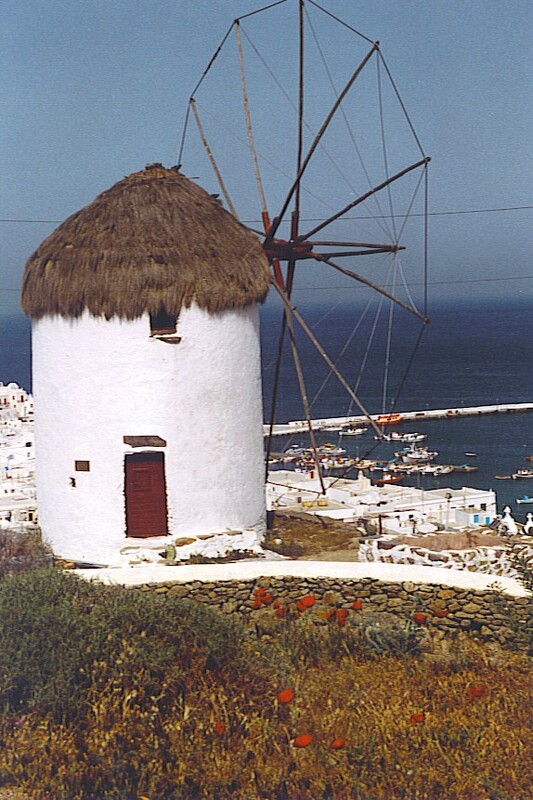 There are some nice windmills on the island of Amorgos but I think the best are in Castilla-La Mancha in Spain. The Spanish ones are associated with the expression “tilting at windmills”, which basically means taking on a project that is doomed to failure. It comes from Don Quixote’s mistaken belief that the windmills of the LaMancha region were giants — he attacked them with his lance. Thanks for the comment, Andrew.